Vodafone is at the heart of the mobile future - where telecommunications, infotainment and information technology meet. It is a highly customer-driven organization and believes that happy, fun people who enjoy coming to work equate to a great experience for its customers. Vodafone employs around 1400 staff in New Zealand and keeps its management structure as flat as possible to ensure that the decision-making ability is closer to the customer. Vodafone’s employees are encouraged to take personal responsibility for their choices and to strive to delight customers. In order to meet its objectives via its people, Vodafone recognize the importance of outstanding internal communication. The Vodafone team need to be informed, engaged and enthusiastic so that they can anticipate customer needs and deliver greater quality and value, faster than anyone else. Vodafone needed to overcome a number of internal communications issues. It was difficult to centrally manage the number and diversity of messages being put out by different areas of the business. ‘All staff’ emails were viewed as a junk medium due to high usage. In most cases they were ignored, in some cases they were automatically trashed. Hence cut-through for important messages was difficult to achieve. Staff surveys were generally posted on the intranet and a link was sent out via email. Due to the issues associated with emails, the response rate to staff surveys was low. Managers needed to chase staff to ensure that important employee surveys were completed. Team meetings were filled with reminders, business updates, product and service updates etc. Vodafone wanted to ensure that team meetings were efficient, effective and focused on their goals – not spending time covering off ‘housekeeping’ issues. Vodafone were moving to a global intranet which due to its sheer size would be harder to navigate. They were looking for a tool to help direct people to the information they needed. Their main objectives were to easily gather staff feedback, ensure employees could focus more on customers and less on administration, increase employee engagement and promote Vodafone’s ‘one team’ culture and ‘I Belong’ community spirit. The Vodafone internal communications team were looking for a way to communicate with their people in an innovative, fun and effective way. Working closely with Vodafone, SnapComms customized existing offerings and developed a new tool to meet Vodafone’s internal communications objectives. Screensavers use images and animation to convey corporate communication messages. 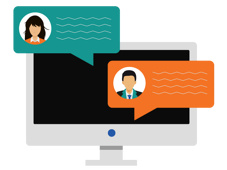 Desktop alerts ensure cut-through for important business messages on any device type. Staff surveys collect employee feedback and allow managers to analyze results. A staff quiz can enhance culture and test employee understanding of business topics. Digital internal newsletters are user-generated, where all staff are able to submit articles. Prior to the use of the SnapComms tool, the Vodafone default screensaver consisted of the user’s name and telephone number. Now their screensavers are used as live billboards to project brand messages, business goals and motivational messages, promote events, drive intranet usage and to inspire staff to submit business feedback and ideas. Vodafone wanted to reduce the number of ‘all staff’ emails and to build community spirit and staff engagement levels, so came up with the concept of the electronic staff newsletter "The Lot". Their internal communications team worked closely with SnapComms to turn this vision into a reality. The Lot is used to welcome people to the business and farewell those leaving, run fun competitions, advertise internal staff vacancies and communicate housekeeping updates. Vodafone recognize that their employees often have vital insights on important business issues or have ideas for how to improve business performance. SnapComms Surveys allow Vodafone to capture these insights and suggestions, as well as to measure cultural and behavioral shifts. An example is Vodafone’s ‘i.commute’ survey which tracks how staff travel to and from work. Vodafone is promoting fresh ways of travelling to work as part of its Corporate Responsibility program. The survey shows that, compared with two years ago, there's been great progress with more staff using public transport and less driving alone in their cars. 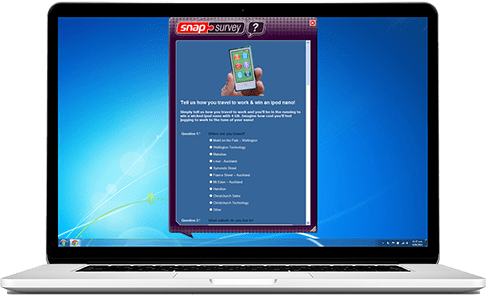 “The SnapComms Survey tool is a great benchmarking tool,” says Annette Culpan, Internal Communications Manager. Vodafone use the Staff Quiz tool to build awareness and reinforce knowledge of key products, services and projects. By using interesting themes and offering prizes, Vodafone is able to ensure high participation rates. With the aid of the SnapComms tools, informed, enthusiastic, empowered staff can continue to deliver the high standards that customers have come to expect from Vodafone. 80% of people thought screensaver content was ‘excellent’, ‘really good’ or ‘pretty good’. 50% of people notice every time a new one comes out. 90% of people do a quiz ‘every time one comes out’, ‘quite often’ or ‘sometimes’. 80% of people ranked the quiz content as ‘excellent’, ‘really good’ or ‘pretty good’. 2,500 people read ‘The Lot’ eNewsletter every month. 50% of people read ‘The Lot every time it comes out’ or ‘quite often’. The SnapComms internal communications tools brighten the office making it more vibrant. It has positively impacted staff engagement levels and brand alignment.